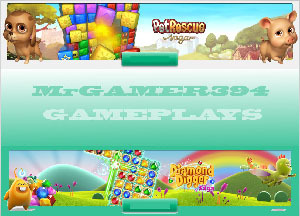 These Pet Rescue level 383 cheats and tips will help you beat level 383 of Pet Rescue. The objective of Pet Rescue level 383 is to save 1 pets and score 20,000 points in 40 moves. You need a substantial amount of room to work in Pet Rescue Saga level 383. Unfortunately, there are so many cages around your pet that it’s tough to make any large matches. To give yourself more room on the right side, use a directional blaster to remove a full row on the left side of the board. Whether it’s from the top down or bottom up doesn’t matter, as long as you remove the entire column at once. After you have a lot more room on the right side, you can look for large matches and charge the column blaster. Once it’s ready, destroy a full layer to the immediate right of the pet’s column. Keep charging the column blaster several times to get rid of all the cages to the pet’s right side. Don’t use it on the pet yet, or it’ll be trapped in the cage. Once the column to the right of the pet is clear, you can drop bombs into it. Use one more column blast to remove a layer of protection on the cages under the pets. Make matches under the cages to drop them into the bottom row. This will create a chain reaction that will soon break the pet’s now-wooden cage, freeing it.